Take command of the most challenging projects using the immense power of the newest member of the KONA product line. 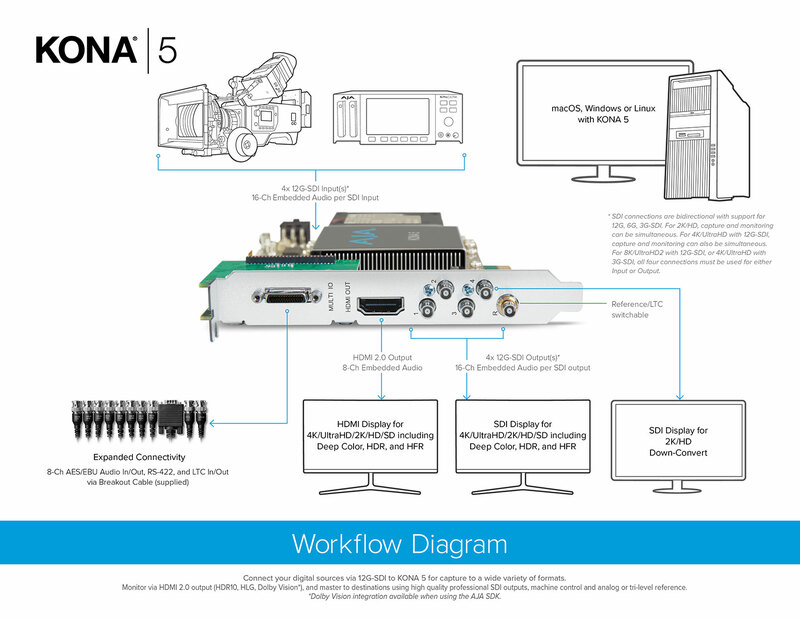 KONA 5 is AJA’s blazingly fast, 8-lane PCIe 3.0 I/O card, designed for today’s most demanding video and audio workflows. Whether you are working with HFR 8K/4K/UltraHD, 2K/HD, SD, Deep Color and/or HDR, experience the quality and peace of mind that KONA 5 brings to your world. Supporting 10-bit 4:2:2 and 4:4:4, or even 12-bit* color spaces for pristine imagery, KONA 5 allows the flexibility to ingest and output with 12G/6G/3G-SDI and monitor with a full-size HDMI 2.0 port. The bidirectional 12G-SDI ports provide immense flexibility for capture and simultaneous pass through, and with the appropriate software, multi-channel capture and streaming. For HDR workflows, KONA 5 supports HDR10 and HLG* for rich color delivery over HDMI 2.0. KONA 5 has the power for the work you do today and into the future. KONA 5 boasts 4x bidirectional 12G-SDI spigots with a Reference Input and 4K/UltraHD I/O can be achieved with either a single 12G-SDI or 6G-SDI cable, or quad 3G-SDI cables. 2K/HD I/O can be achieved with a single 3G-SDI cable, or dual link 1.5G-SDI, while allowing capture and monitoring via SDI to take place simultaneously. A full-sized HDMI 2.0 connection offers monitoring and output, with HDR , Deep Color and HFR support. Across the board, KONA 5 is the professionals choice for post, broadcast, graphics, virtual sets, pre-viz, live compositing and more. HDR (High Dynamic Range) provides the ability to display a wider and richer range of colors, much brighter whites, and much deeper, darker blacks than standard signals allow. This gives your imagery a more ‘dynamic’ look and allows for natural true to life colors to be communicated to your audience. KONA 5 delivers robust HDR compatibility to HDMI displays with support for HLG and HDR10 with HDR Infoframe metadata, in accordance with HDMI2.0a/CTA-861.3 and HD. Connect your digital sources via 12G-SDI to KONA 5 for capture to a wide variety of formats. Monitor via HDMI 2.0 output (HDR10, HLG, Dolby Vision* and HDR10+*), and master to destinations using high quality professional SDI outputs, machine control and analog or tri-level reference. *Dolby Vision and HDR10+ integration available when using the AJA SDK. KONA 5 can be locked to an external reference for integration into larger productions, or feed LTC in and out to ensure footage captured with KONA 5 has the proper timecode. A 9-pin RS-422 port on the included breakout cable allows control of a range of external devices for frame accurate captures and layoffs. The built-in hardware downstream keyer allows graphics and images to be easily overlaid on the input video in realtime. AJA Technical Support is recognized as one of the best in the industry and is provided at no additional charge. Our support team will work with you to solve any issues you might encounter and get you working as quickly as possible. and multi-channel power for a wide range of creative applications. AJA’s technical support is recognized as among the best in the industry and is available to all AJA customers. If you need assistance with any aspect of your KONA installation, configuration, operation or encounter any technical issue, AJA Support will work with you to get up and running. KONA products are covered by a generous three year international warranty. Note: High Frame Rate and 8K/UltraHD2 capabilities are dependent on host system attributes. Not all systems and configurations will support all frame rates and raster sizes. *Bit depth support is application dependent. Check with your software manufacturer for compatibility. **HDR support is application dependent. Check with your software manufacturer for compatibility. 4K/UltraHD with 12G-SDI, capture and monitoring is simultaneous. 4K/UltraHD with 3G-SDI, all four connections must be used for either Input or Output. 8K/UltraHD2 with 12G-SDI, connections must be used for either Input or Output. Note: When connections are configured for 12G-SDI or 6G-SDI, only UltraHD/4K/UltraHD2/8K formats are supported. 28W typical, 35W maximum via ATX power. Note: Unlike other KONA cards, KONA 5 uses PCIe power from a 6 pin ATX connector, rather than the PCIe slot.